Sixty-six million years ago, an asteroid struck the earth and wiped out non-avian dinosaurs. Now, researchers reporting in “Current Biology” on May 24 have pieced together what that asteroid impact meant for birds. 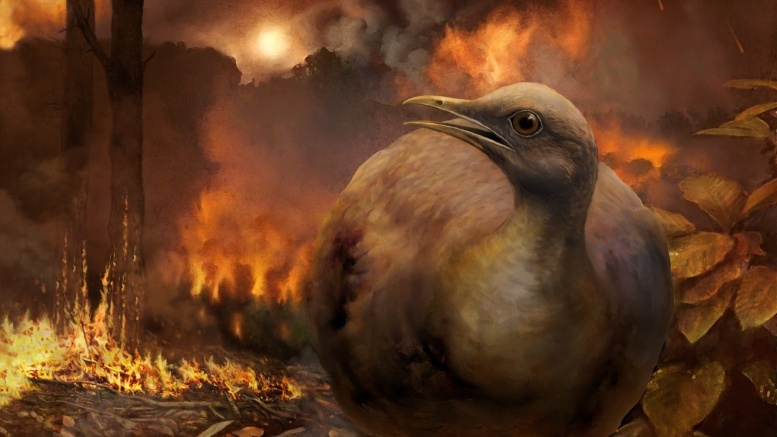 From multiple lines of evidence, including the plant fossil record and the ecology of ancient and modern birds, they show that the only birds to survive the Cretaceous-Paleogene (K–Pg) mass extinction event lived on the ground. Birds that lived and nested in trees went extinct because the asteroid’s impact destroyed forests worldwide, which took hundreds or even thousands of years to recover. The researchers’ analysis of the plant fossil record confirmed that global forests collapsed in the wake of the asteroid’s impact. They then used the evolutionary relationships of living birds and their ecological habits to track how bird ecology has changed over the course of their evolutionary history. Those analyses showed that the most recent common ancestor of all living birds—and all bird lineages passing through the extinction event—likely lived on the ground. By contrast, many birds that lived at the end of the age of dinosaurs exhibited tree-dwelling habits. However, those species didn’t survive the K–Pg to give rise to any known modern-day birds. The ancestors of modern tree-dwelling birds did not move into the trees until forests had recovered from the extinction-causing asteroid. The findings illustrate the fundamental influence of major events in Earth’s history on the evolutionary trajectories of major groups of organisms, the researchers say. In the future, the team plans to continue to explore the precise timing of forest recovery and the early evolutionary radiation of birds. Co-authors of the study are Antoine Bercovici of the Smithsonian National Museum of Natural History, Jacob Berv of Cornell University, Regan Dunn of the Field Museum of Natural History, Tyler Lyson of the Denver Museum of Nature & Science, David Fastovsky of the University of Rhode Island, Vivi Vajda of the Swedish Museum of Natural History, and Jacques Gauthier of Yale University.